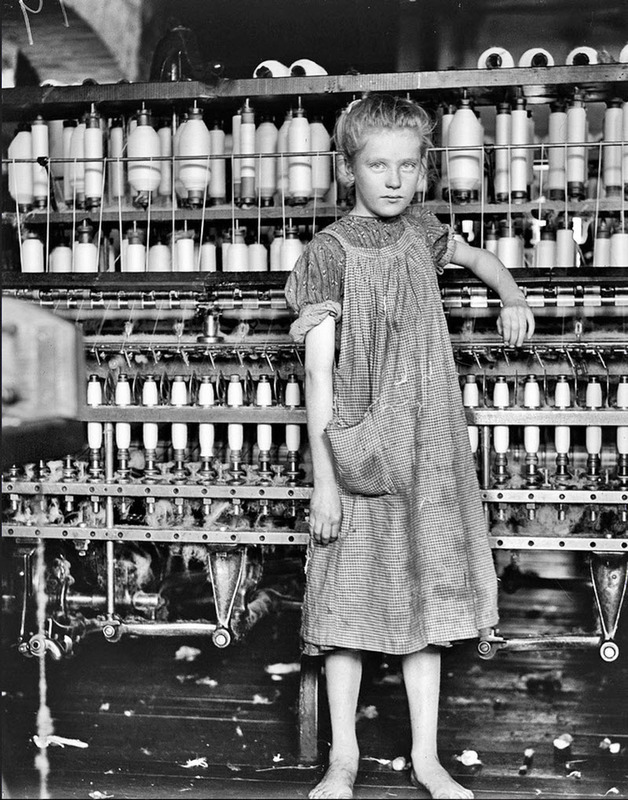 A little girl works at a knitting mill at the Louden Hosiery Mills in Loudon, Tennesseem 1910. She is so young and small that she has to stand on a stool in order to reach her machine, yet she is doing the same work as the adults next to her. 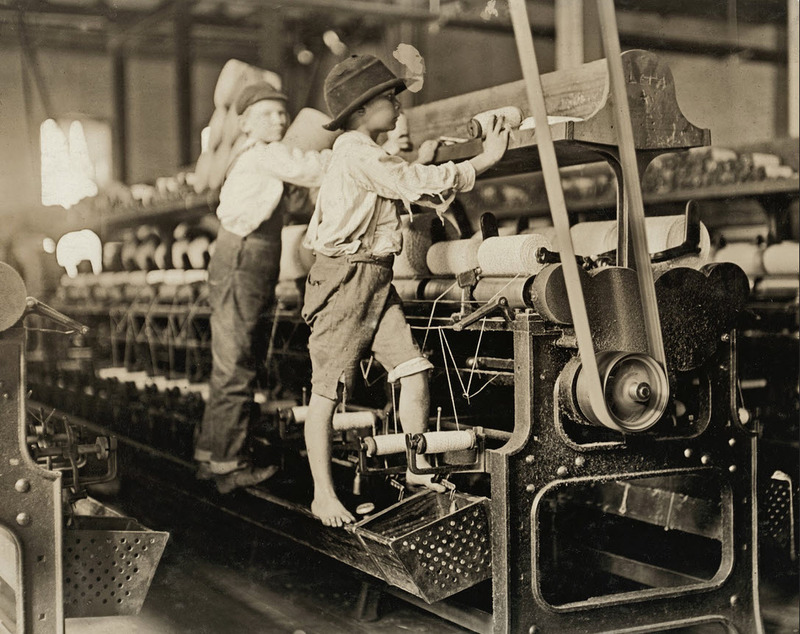 When the United States began to industrialize, factory owners made extensive use of child labour. 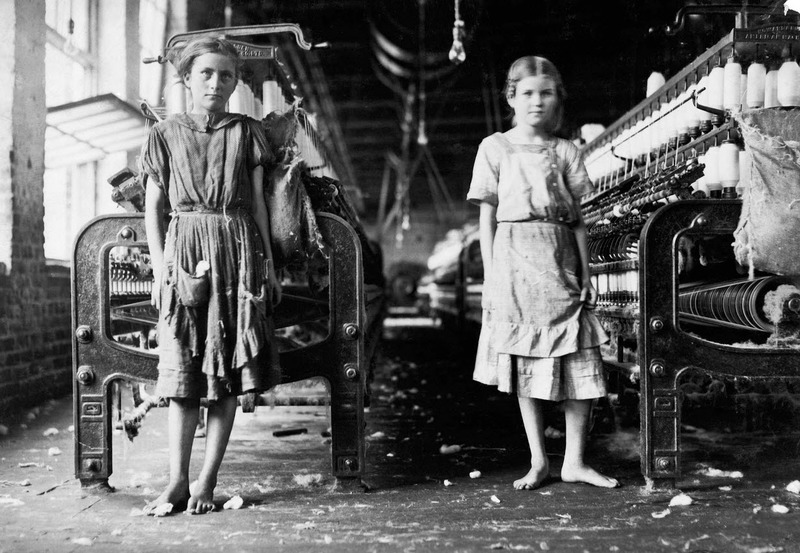 Children worked in many factories, but were especially common in the textile mills. Families in mill towns often depended on the income that their children brought in to make ends meet. 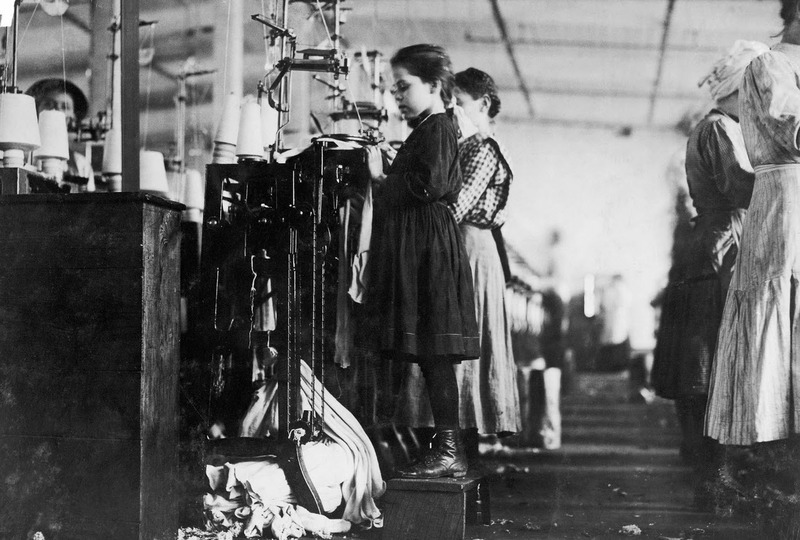 It was not unusual for eight year olds to go to work in factories. The girl in the first picture looks well fed and well dressed. But she was not typical of the average child worker. The picture above of Addie Card, 12 years old, in a ragged stained dress and barefoot is more representative of what child labour really meant. Both pictures were taken by Lewis Hine, a photographer and sociologist who documented working conditions in the early 1900s. Hine was frequently threatened and harrassed by factory guards and foremen who were shy of letting the world see what conditions were like inside their factories. Several attempts were made by advocacy groups as well as Congress to pass laws limiting child labour and setting minimum ages for working in factories. However these measures were not successful as they were struck down by the Supreme Court as unconstitutional. Abusive child labour practices finally ended, not as a result of reform, but because of the Great Depression which left so many adults unemployed, that out of desperation adults were willing to take the lower paying jobs usually filled by children. It is interesting to reflect that western nations such as Britain and the United States had lots of children working in factories and even dangerous occupations such as mines, during the early part of the industrial revolution. It was not until the passage of “This little girl is so small she has to stand on a box to reach her machine. She is regularly employed as a knitter in Loudon Hosiery Mills, Loudon, Tennessee, 1910” by Lewis Hine. We can get a glimpse into the society at the time by observing the crowd and the advertising signs. There are billboards peddling Turkish Trophies (cigarettes? ), hosiery, gloves, underwear and liquor and beer. More interesting are the people in the stands. We can see a lot of men, and not a single woman. And the men are all white, are all wearing suits and hats. 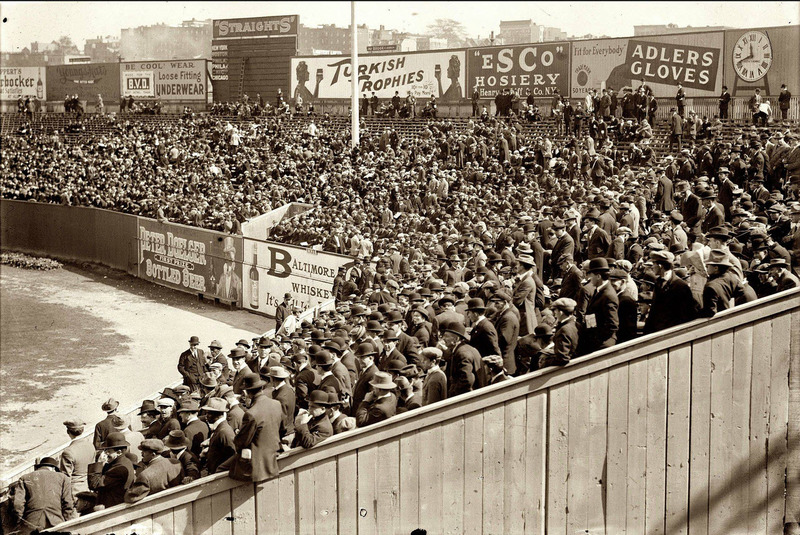 This is not an anomaly – the stands are filled with the same type of people everywhere in the stands. What are we to make of this? Visible minorities and women do not seem to have been welcome at the games. And the men who attended dressed up; some are even wearing top hats. Considering that baseball has always been considered America’s game, can we draw conclusions about American society at the time from this snap shot? Perhaps. But we can certainly say that the world depicted in that picture no longer exists, and that is I think a good thing.